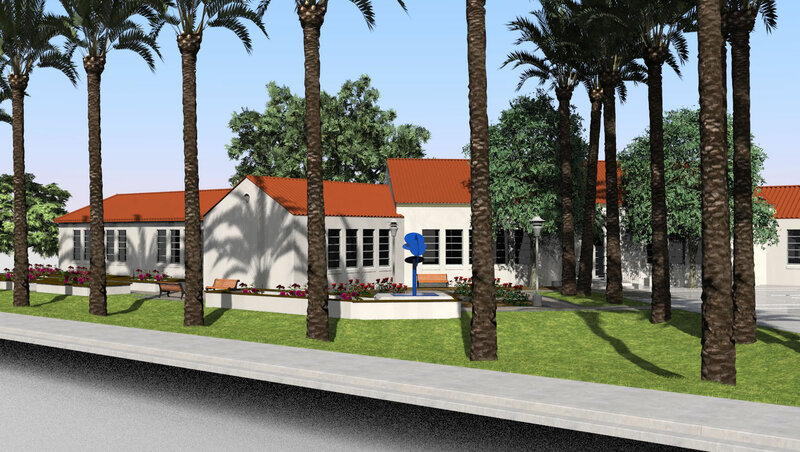 The Scottsdale Loloma School, which currently houses the Scottsdale Artist’s School, will receive a public arts installation this fall. Normally this wouldn’t warrant its own blog post but, considering our offices at loloma 5’s proximity to the school (we are directly across the street) and, more importantly, the fact that the sculpture was based on a preliminary sketch by architect Alfred Newman Beadle, we have to believe it’s noteworthy! Any public art installation by Beadle is almost as synonymous with the architect as his MidCentury designs are. These sculptures, painted in glossy primary colors, typically consist of simple geometric shapes — their futuristic designs arranged to convey harmony — would often feature prominently in front of the latest project. If you’ve traveled past a building in central Phoenix with a large (probably fire-engine red) circular sculpture in scale with the adjacent structure, then that’s probably an installation by Beadle. 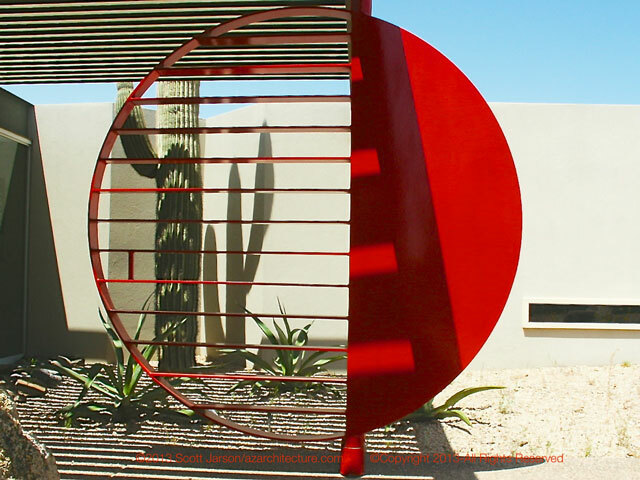 For instance, the Anderson House, designed in 1989, features such a sculpture, integrated into the entrance’s steel trellised patio. An anonymous donor bestowed the sculpture, titled Ziggy’s Sister, produced around 2000, to Scottsdale Arts. After his passing in 1998, Beadle left behind a book of maquettes, none of which he ever made, says Wendy Raisanen, the Curator of Exhibitions and Collection at the council. The finished product meets the specifications, such as its blue paint color, as envisioned by Beadle. “The way I saw it as appropriate as an historical addition to the property, how modern the Museum of the West is and then the Loloma School is much older, so this would be an aesthetic bridge from one to the next,” Raisanen said. The City and Historical Commission currently are working to address minor issues, but Raisanen installation is tentatively scheduled for this fall, when the weather is more hospitable to hold a ceremony, as desired by the Beadle family. They plan to erect the sculpture on a concrete plinth section in one of the raised planters on the northeast corner, in front of the entrance. Anyone with even a passing familiarity with azarchitecture knows we are fanatical followers of this architect and his ethos — just check out our site with all of his work we’ve marketed in the past. So you can expect us to be the first in line at the installation ceremony!